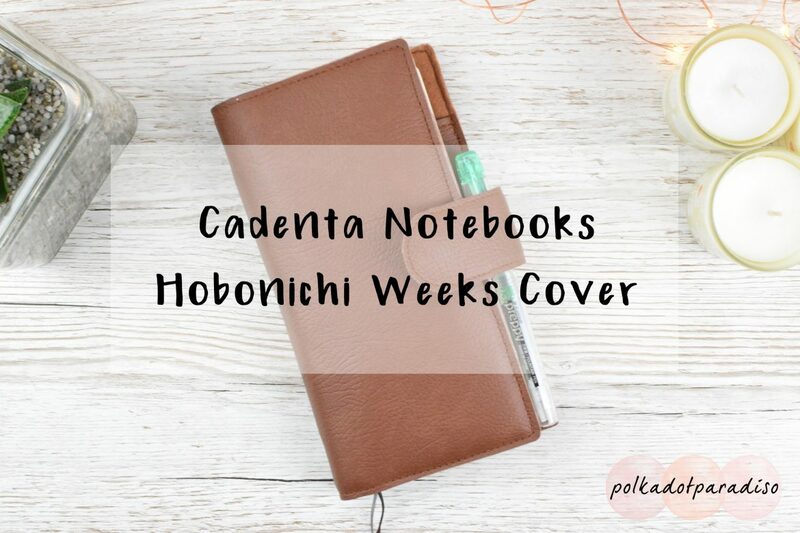 If you saw my initial impressions post about the Hobonichi Weeks, you’ll know I was after a cover for it. I didn’t fancy an actual Hobonichi cover, as I knew I wanted something with a bit more storage. As this is my everyday carry, I needed something that had lots of card slots and hopefully a pocket too. It also needed a pen loop and to have a way of closing it and securing things inside it. I knew I didn’t want anything fabric. Fabric to me = bulk. This needed to be something that I could just pop into my purse and not have to worry about needing lots of extra room. One brand I was recommended by a fellow planner was Cadenta Notebooks. I’d never heard about Cadenta before but they’re all about the Travelers Notebooks. They also only use vegan leather. It’s not something I’ve purchased before, but it looked beautiful and realistic in the pictures. They have a small range of Hobonichi covers with strings, just like a TN. They mainly focus on Weeks covers, but they do have one A6 cover. After much deliberation I settled on the Caramel Brown with snap closure. This won out for two reasons – the snap enclosure as it makes the notebook so much more accessible. Particularly if you’ll be using it in shops to grab cards and vouchers. Secondly, the colour is lovely. It’s a lightish brown that I knew would fit in nicely with my bags and purse. Handbag essentials ft. My new @cadeneta_notebooks Hobonichi Weeks cover. In terms of inside the cover you get six card slots and a long vertical pocket in the front. At the back you get a larger secretarial pocket. You also get a large pen loop. The only thing I would say about the pen loop is it won’t work with all pens. Cadenta do say they’ll try and accommodate requests to change it, presumably if you need a wider pen loop. What caught me out initially was how low down it was. As you can see, it just fits my fountain pen without sticking out of the bottom. However, with some pens (such as my Pilot Juice), they do actually poke out of the bottom of the cover when in the loop. I was a bit unsure how I’d get on with the strings. I was worried the planner may move around and not feel too secure. However, to get round that I actually undid the string and threaded it through the back of the planner. This makes the planner move around very little in the cover and I much prefer it to a traditional set up. The only problem, as you can see from the picture, is it does bend the Hobo slightly. As it’s only ever going to live in this cover I’m not too bothered though. It doesn’t smell! That was my biggest concern about ordering this. Sometimes PU leather can smell and in fact my Weeks itself did smell a little when it first arrived. The feel of this isn’t exactly like leather, but does feel nice to touch and not overly fake or nasty. The vegan leather is lined with a felt that matches the colour of the leather. It’s very soft but doesn’t show any signs that it might not be withstand wear and tear. Overall it’s very good. You can see the layers of the leather on the side of the card pockets though it doesn’t look like it’ll pull or fray. The only complaint I’d probably have is that the cut out of the leather around the snap clasp isn’t perfect. However, it’s a handmade product that was made to order and I’d never expect it to look like a machine made it. I’m really happy with this. Including shipping it was less than £35 from Spain. It’s such a shame they don’t do Cousin covers as I’d have probably bought one to match. This is perfect for my everyday carry. It holds all the cards my purse can’t fit and the huge stack of vouchers I carry around with me (thanks Boots!) I love using the back pocket for my Weeks sticker kits. Because the cover itself is so flexible I can put my Pentel Slici just in the cover, close it, and it doesn’t fall out. Have you got a cover for your Weeks? Let me know where yours is from in the comments below! Please note, this post contains affiliate links. They don’t cost anything to follow, but do help support the blog!